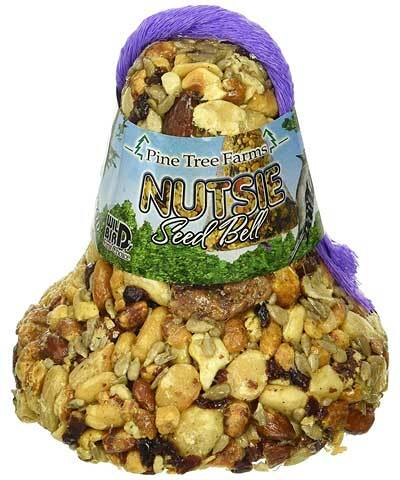 Watch your backyard birds go crazy over their favorite foods by adding this Pine Tree Farms Nutsie Seed Bell with Net to your garden. The whimsical shape of this piece easily captures attention, while the mixture of nuts and dried fruit is great for a wealth of birds. The nuts and sunflower hearts offer necessary protein and fat to your feathered friends, while the dried fruit adds flavor. A gelatin binding helps the bell maintain its shape, and the included, purple mesh net makes the item simple to hang. Invite a wealth of birds to dine in your yard by placing this Nutsie Seed Bell with Net in it. Made in the USA.